In the past I have written about propaganda floats in a half dozen articles. My old friend retired Lieutenant Colonel Dave Underhill thought it was time that I do a story just on that subject alone. The main reference document in this article is the 7th PSYOP Groups publication: The Propaganda Float in Psychological Operations. 500 copies of the booklet were printed. Besides that booklet I have used leaflets and data from my own files and correspondence. When the United States wants to disseminate propaganda it has several methods. Face-to-face and hand-to-hand is the preferred method, but soldiers cannot hand out propaganda when an enemy controls the ground. Air dissemination of leaflets works well but it does put the aircraft and crew in danger. That may change in the future with the developing use of drones, but at the present the enemy will fire at aircraft dropping leaflets while flying low and slow. And, in some cases the countries that are being leafleted are not at war with the United States so the distribution of the propaganda must be clandestine. Thus, the propaganda float. This is a very low-cost and safe way for one country to send propaganda to another using lakes, streams and rivers. The United States has used such floats in World War II, Korea, Vietnam, and Desert Storm. The ability to present a comprehensive packet of selected gift items and printed media in a single float is the biggest single advantage of floats over other delivery methods. The receipt of a single float permits the operator to place the full story into the hands of the target audience. The best part of the campaign is that anything that floats can be used as a propaganda leaflet carrying device. This includes bottles of all sizes, plastic bags, balloons, tin or plastic boxes and even pieces of wood. Waterborne dissemination of propaganda was discussed as early as the American Revolutionary War when Benjamin Franklin wrote to Colonel Thomas McKean and enclosed a number of Congressional resolutions translated into German. Franklin recommended that the documents, along with other small gifts, be conveyed over the water to the Hessian encampment opposite the New Jersey shore in drifting canoes. Since some of the literature was printed on tobacco paper, Franklin recommended that a little tobacco be added to the floats. He was far ahead of his time. In WWII the Allies airdropped cigarettes, matches, seeds, soap, coffee, and even tea bags to keep up the morale of the citizens of the occupied nations. During the Cold War years 1964 to 1968 the United States Air Force leafleted the Democratic Peoples Republic of Korea (DPRK) in an attempt to influence the citizens and ruling class of that nation. The U.S. Army 7th Psychological Group classified confidential booklet, A Report on Operation Jilli mentions propaganda floats. 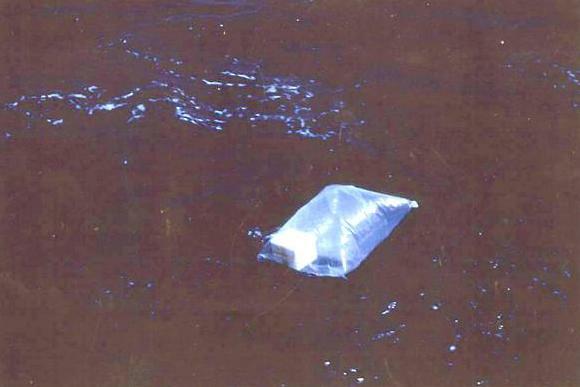 A relatively heavy, dense package riding low in the water. This package is influenced primarily by water currents. A relatively lightweight package with about half of the volume exposed to surface winds. This package is influenced by both current and surface winds. A lightweight package with most of the volume exposed to surface winds. This package is influenced primarily by surface winds. An anchored float in which there is no movement. This float is positioned for discovery by members of the intended target group. They say we are lost. 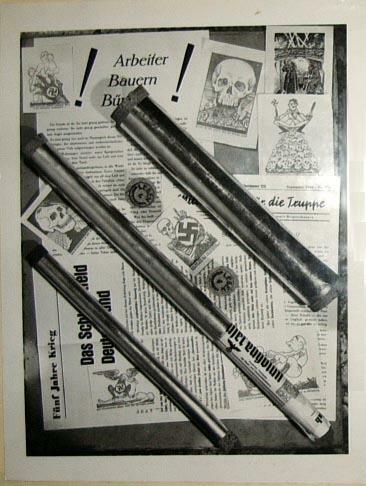 During WWII the Office of Strategic Services Morale Operation Branch in Rome floated miniature copies of the propaganda newspaper Das Neue Deutschland (The New Germany) inside metal cylinders and food tins on various rivers leading into Germany or German occupied territory. In Switzerland, another group called Team Navig (Navigation?) was responsible for the introduction of leaflets into Germany, via the Rhine river channel, by means of floating tubes 20 centimeters in length and 25 to 35 millimeters in diameter. 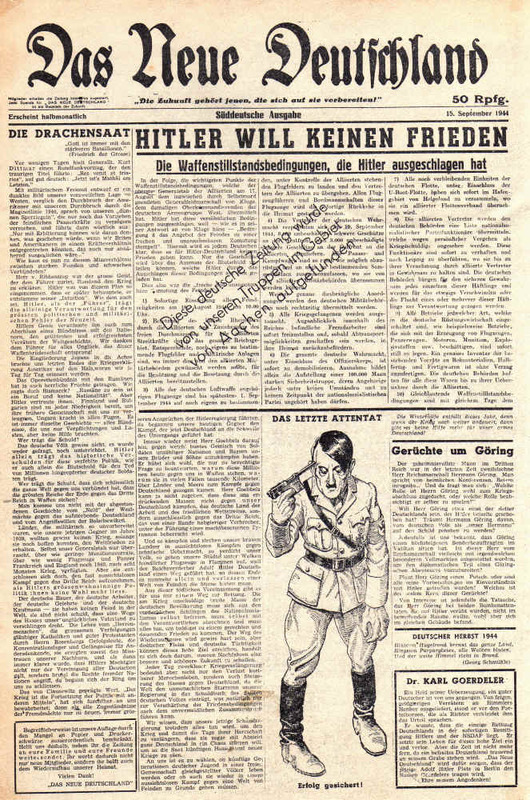 These newspapers were regularly printed and disseminated over Germany and its occupied areas to tell the German troops and civilians the true status of the war and forecast the eventual defeat of Germany. Large-volume dissemination is necessary because a great number of containers will never reach the designated audience. One of the earliest recorded incidents involving the use of Propaganda floats comes from Vietnam. Generals Le Loi and Nguyen Trai while fighting the Chinese from 1417 to 1427, used grease or honey to write patriotic phrases on the large leaves of the forest trees to target superstitious citizens. Ants ate the organic product absorbed in the leaf tissue and the words were exposed: Le Loi for King, Nguyen Trai for Minister of State. Some of the leaves fell upon the waters of streams and were carried to adjoining areas. People noticed the perforated leaves and interpreted them as a divine message. They joined the Vietnamese forces and defeated the Chinese. 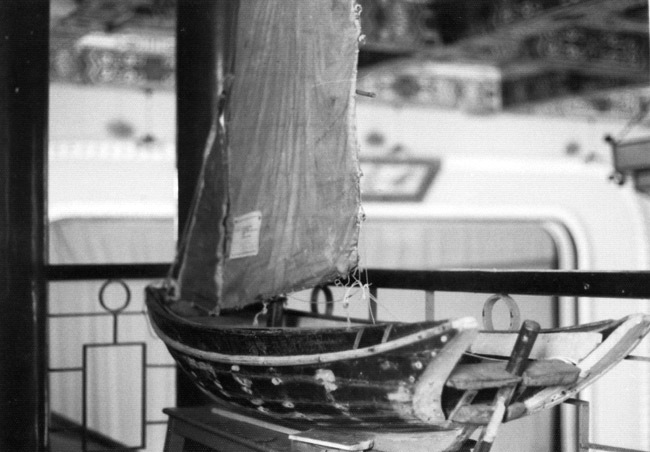 The American waterborne dissemination technique in the Vietnam War was comparatively simple and inexpensive. Propaganda material is placed in buoyant, waterproof containers and dropped from low-flying aircraft, ships, or boats at predetermined locations. Prevailing winds, tides and currents carry the floating containers to the target area along ocean beaches or riverbanks. The containers can be wood, bamboo, plastic, glass or similar materials. During the Vietnam War, psychological operations personnel in IV Corps sent over 250,000 float bags filled with propaganda literature and gift items to farmers and fishermen living along the waterways of the Mekong delta. The entire quarter-million floats were placed in the water in a single day. One helicopter pilot reported sighting a small wooden craft whose entire front end was filled with float packages. The boatman had systematically retrieved every float he encountered as he proceeded up the canal. I assume that he made a nice profit later selling the gifts in the local markets and street stalls. 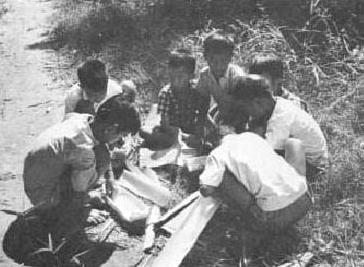 A popular game among young Vietnamese was to place messages in banana stalk floats and send them down a river or stream. 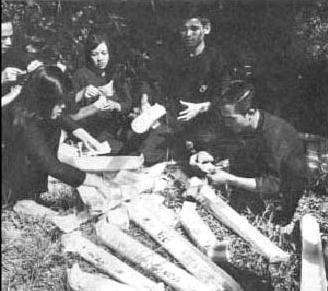 During the Vietnam War, the South Vietnamese Culture-Drama Teams would use this same method to send propaganda leaflets to the Communist Viet Cong. The Van Tac Vu (Office of Literary Production) teams did this as part of their Returnee Propaganda Tasks. They taught the local children to take part in this returnee program too. During the long years that the United States of America aided the Republic of Vietnam in the battle to retain its independence, a number of Allied radio stations broadcast to Vietnam. The Ministry of Defense in Saigon operated the Voice of Freedom with transmitters in Hue. The Americans provided financial, technical and advisory assistance to the Vietnamese broadcasters. Some other stations broadcasting to the Vietnamese were Radio Saigon, the Voice of America, and the British Broadcasting Corporation. 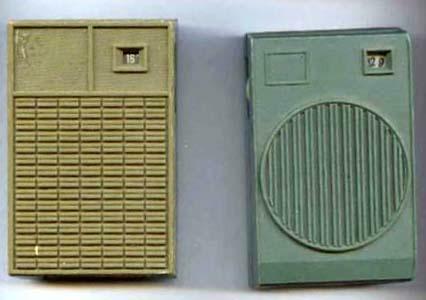 In order to facilitate the listening of the programs, thousands of small transistor radios were dropped over North Vietnam or floated ashore from the Gulf of Tonkin. They were preset to Allied radio stations. Another method for floating a propaganda radio ashore was quite complicated and used both floats and balloons to accomplish the mission. Two J-100 weather balloons were attached by a string to a chemical fuse. The fuse was attached by a string to a piece of wood. The radio was attached above the fuse. The duration of the fuse was measured in hours. The US Navy launched the whole package into the ocean where it was blown to the North Vietnamese shoreline. It would bounce along the beach until the wood was lodged and acted as an anchor. Eventually the fuse would burn through releasing the two balloons with the radio. Released from the wood anchor, the balloon rapidly rose. Eventually, one would burst from expansion, and the other, being incapable of lifting the radio would settle down until the radio came gently to rest on the ground. The following morning, there would be balloons in the sky or all along the populated coastline anchored by the radios. The Vietnamese would be drawn to the balloon out of curiosity and thus find the radio. The U.S. Armys 9th Infantry Division's 3rd Battalion, 27th Infantry circulated leaflets by using toy sailboats. 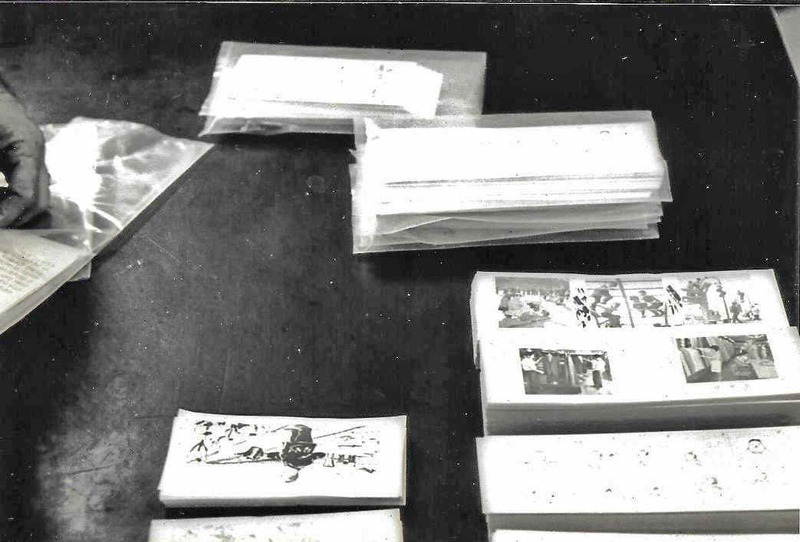 The leaflets resembling the Vietnamese national flag were attached to large spikes driven into foot-long pieces of two-by-four wood. They targeted the 516th Main Force Battalion of the Viet Cong. The message encouraged the Viet Cong to lay down their arms and returned to their family and friends. Education was big in our campaign efforts due to the ability to find distinct village populations with roads, canals and surrounding farm lands. We were deadly serious in trying to help the people. We did have some success, but the failure rate of wet baggies plus the poison story by the Viet Cong made the overall mission a failure. There was another operation where propaganda floats were dropped off the coast of North Vietnam by a United States Navy submarine. The clandestine Studies and Observations Group (SOG) directed that operation. 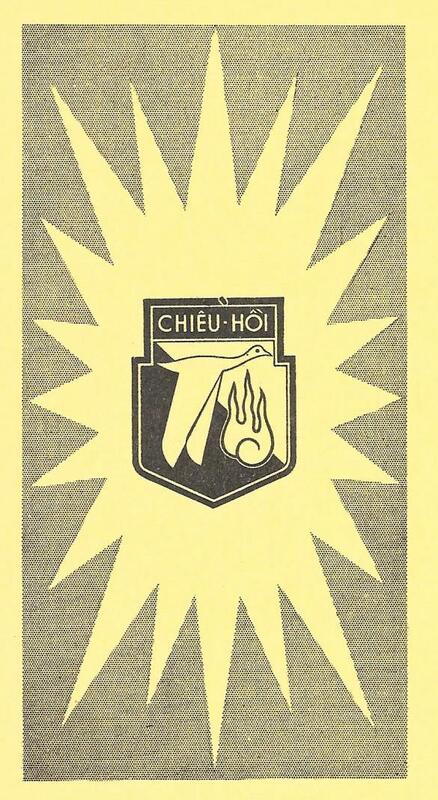 This American Chieu Hoi leaflet coded 2530 depicts the Chieu Hoi (Open Arms) symbol on the front. The back has a poem from Chairman Ho Chi Minh telling of Viet Cong and North Vietnamese Army victories, and a counter-poem from a Communist defector telling of the actual terrible defeats suffered by his unit. This poem was composed by Rallier Truong Dinh Du out of his anger at the actual Communist defeat while "Uncle Ho" still continues to brag about victory. The counter poem was poorly constructed, mainly by paraphrasing the original one and by replacing positive words with negative ones. This is considered a pitiful style in writing couplets, where words must be skillfully chosen to counter the original verse, but never to repeat. 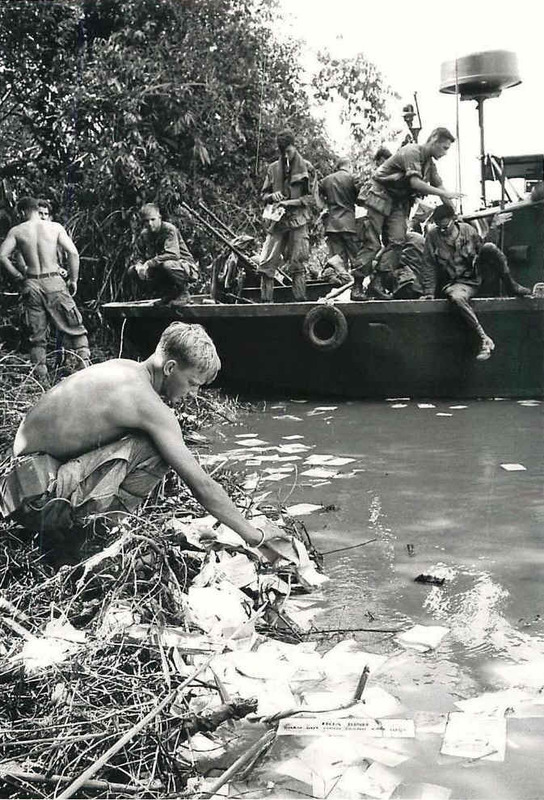 The U.S. Marines in the Rung Sat Special Zone in January 1967 combined pacification operations with intensive leaflet, loudspeaker and civic action programs.Marines placed a Chieu Hoi leaflet and a cigarette in plastic bags and floated them up the mouths of rivers during evening tides; similarly, plastic buckets containing a washcloth, a half piece of elephant soap, needles and thread, and a leaflet were drifted into Viet Cong areas. 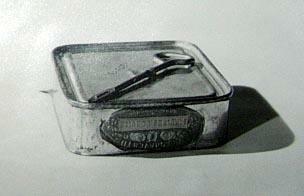 On three occasions near Tet 1965, gift boxes were found drifting in transparent plastic boxes near Liem Lap hamlet. They contained childrens clothes, handkerchiefs, lighters, pencils, pen and pen holders, and fishing lines and hooks. Security agents confiscated the boxes saying that if they were brought home they would explode. In addition, if the finders wore the clothes after 3 months and 10 days their skin be swollen and they would die from poison that the enemy soaked into the cloth. Rather than risk dying by wearing T-shirts that were included in the package, they put the T-shirts on their pigs. The pigs showed no ill effects, so they washed the T-shirts and wore them. 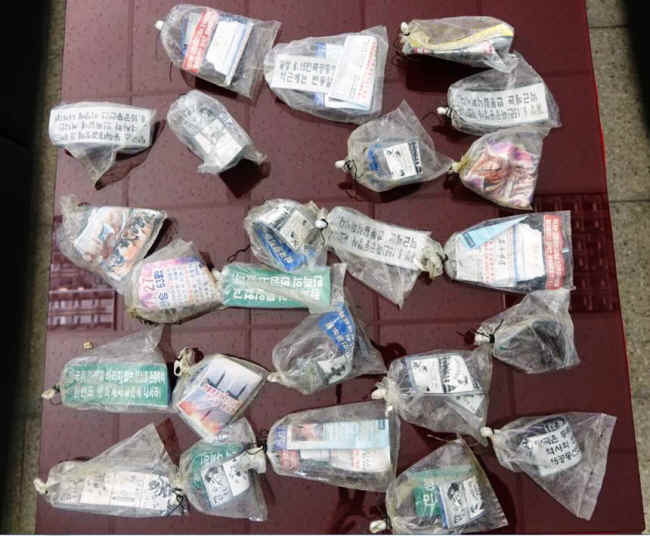 When the villagers and the soldiers found leaflets, they usually read them out of curiosity thinking that the leaflets which were disseminated for propaganda purposes might not have been treated with poisonous chemicals. This gift which was floated to you on water is from the Government of Vietnam to you and your family as part of the Truong Cong Dinh Campaign of IV Corps Headquarters in the IV Combat Tactical Zone. Your government wants to keep your waterways free. Support your government and the Truong Cong Dinh Campaign. Note: The Truong Cong Dinh Campaign was a military operation from 14 March to 20 April 1968. The Allies claimed victory with 3,055 VC killed and 2209 more captured. The legendary hero Truong Cong Dinh defeated the French in the 1800s. 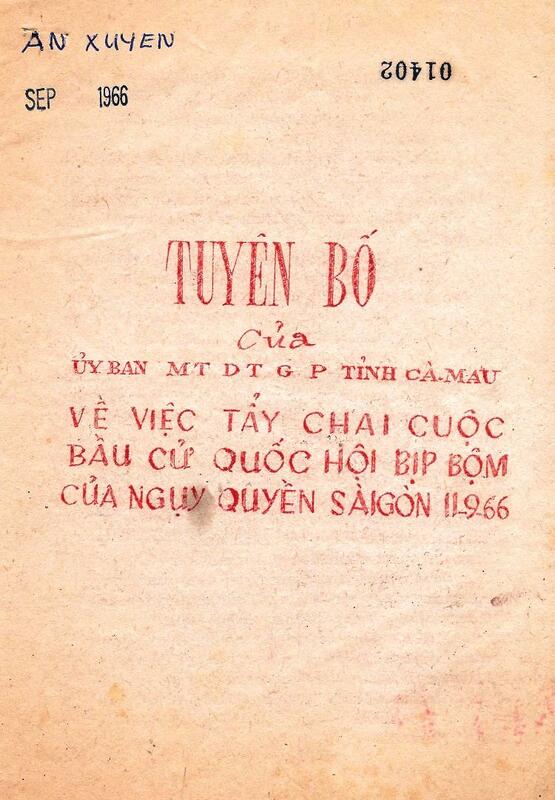 In the operational report directly below this section we mention that the propaganda newspaper Tu-Do was sometimes floated into Viet Cong occupied areas. I illustrate a copy of the newspaper here. Stories include President Nguyen Van Thieu taking part in Paris talks, a photograph of Vice-President Ky providing guidance to the Republic of Vietnam delegates to the Paris talks and President Nixon strengthening US-Vietnam ties. 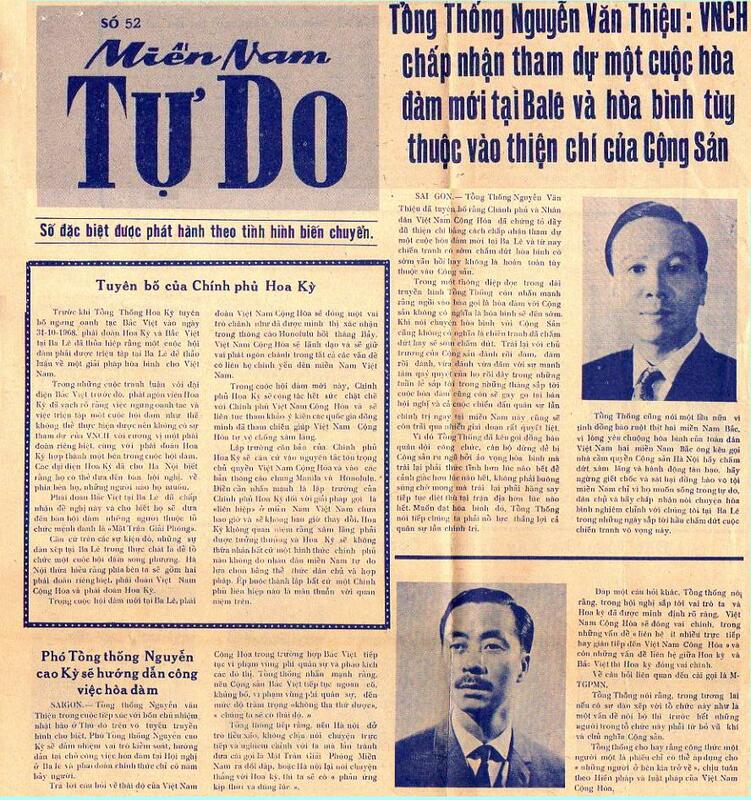 The newspaper Mien Nam Tu-Do was written by the Field Development Division, then printed in the United States Information Agency plant in Manila, with the cost paid for by the U.S. Army (7th PSYOP Group). Each issue was given a regular JUSPAO code number. For instance, mini-newspaper issue 49 of November, 1968 was coded 2984. The newspaper targeted rural areas of Vietnam that were not served by the civilian press. Its purpose was to keep those rural areas informed of national programs in their behalf; publicize Government victories and Communist defeats; developments in the Chieu Hoi program; Free World assistance to the Government of Vietnam; and the anti-Government actions by Hanoi, the NLF and the Viet Cong. The newspaper came in both a regular and a mini-size issue and in different colors. In 1968, 520,000 copies of the mini-issue were distributed to the 44 provinces mostly by hand instead of air drop. The size of the mini-edition is 9.5-inches by 10.5-inches. The full-size newspaper was 10.5-inches by 16-inches. 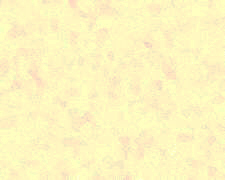 Full-sized number 10 was dated November, 1968 and coded 2987. In 1968, 2,000,000 copies were printed every other week. Occasionally, special issues were produced. The newspaper was printed in Manila and flown to Vietnam for distribution by the four PSYOP Battalions. 1,300,000 copies were issued to the battalion to be airdropped over Viet Cong areas. The other 700,000 issues were shipped to the 44 provinces. Full-sized issue 10 depicted a photograph of President Nixon on the back and news of his election as President of the United States. In January 1968, a study was completed and plans were formulated for a project to reach the population of tightly controlled Viet Cong areas by means of attractive waterproof jackets containing leaflets and brochures along with gifts (soap, thread and needles, tooth brushes, crayons, etc.) floated into the targeted areas by means of numerous canals and waterways of IV Corps. Arrangements were made with the Binh Thay Naval Base S5 (Civil Affairs) to supply the 10th PSYOP Battalion with detailed intelligence of the targeted groups in the river target areas and a means of delivery. A search was made for a source of cellophane bags and a bag sealer. 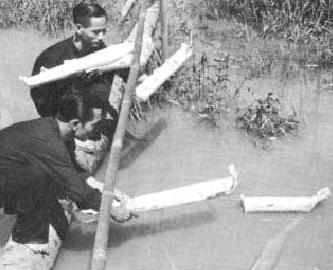 On 1 September 1967, a Viet Cong float was discovered and seized in the Co Chien River by a U.S. Navy Patrol Boat River (PBR) of river section 523. Propaganda leaflets and a propaganda banner were found on the float. 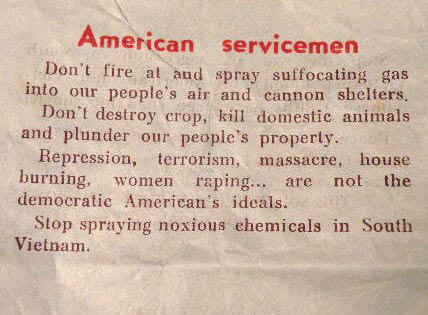 Viet Cong troops launching rocket attacks on the big Da Nang fighter base are supplementing them now with propaganda leaflets aimed at Negroes. The first of the leaflets calling on Colored American Servicemen to surrender turned up Christmas Day. 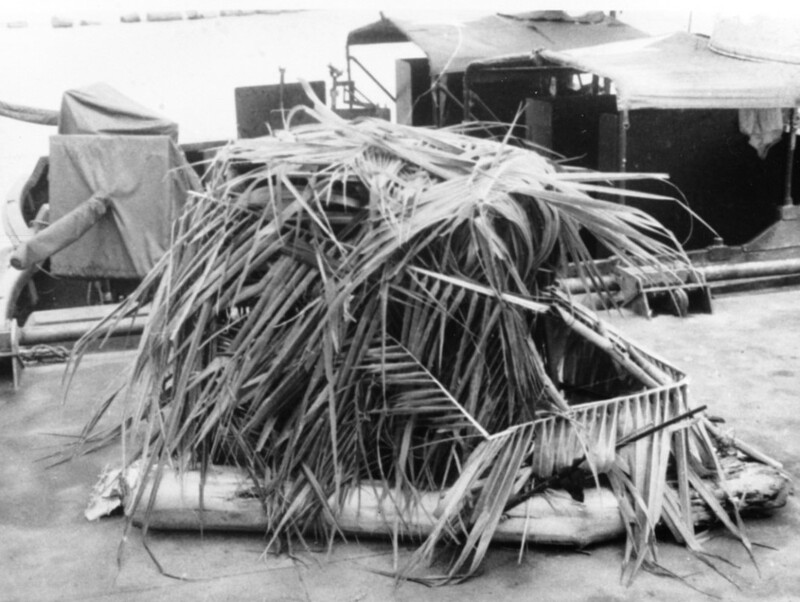 It was attached to a log float sailed down the river near the base camp if the 1st Battalion of the 7th Marine Regiment. The float, picked up Christmas Day, had a wooden cross on it, letters cut out from crepe paper spelling out Noel and a North Vietnamese flag designed from crepe paper. Two similar floats were sent down the river but both of these were booby-trapped. are not the democratic Americans ideals. Stop spraying noxious chemicals in Vietnam. Stop the war of aggression in South Vietnam! Bloods of American and Vietnam youth have been shed too much. Peace in South Vietnam and repatriation for all U.S. Troops! What do you do if you are Viet Cong and have no Navy and no time to prepare propaganda floats? You simply place the leaflets in the water and let the current take them wherever it goes. 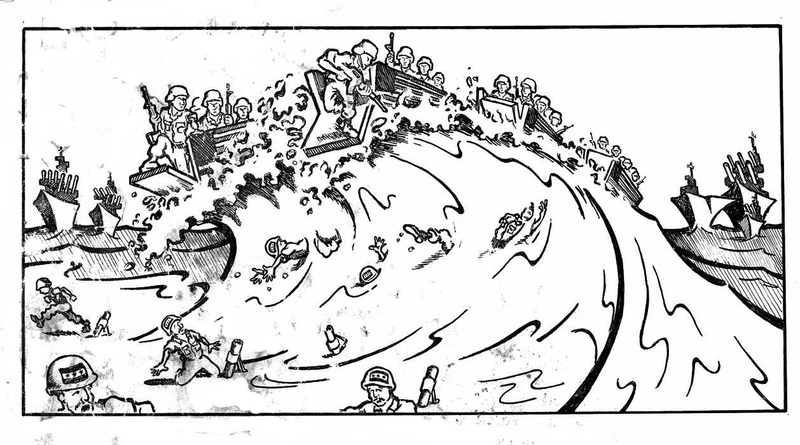 Here U.S. troops from the Brown Water Navy clear the stream of anti-U.S. and South Vietnam propaganda. The propaganda float operation directed against North Korea was begun in 1965. North Korean officials ignored the operation for a long time. Internally, instructions were passed by various Party officials to deal with the situation. Initially, propaganda floats were systematically prepared on an assembly line basis. This proved to be an error in judgement on my part. If someone attempted to conceal an item, North Korean authorities simply had to located one package intact, inventory it, and then round up all items that were on their inventory list. However, we introduced the technique of systematically placing items in the float package on a spotty basis. The absence of an item would not create undue suspicion when the float package reached security officials because all packages were not the same. 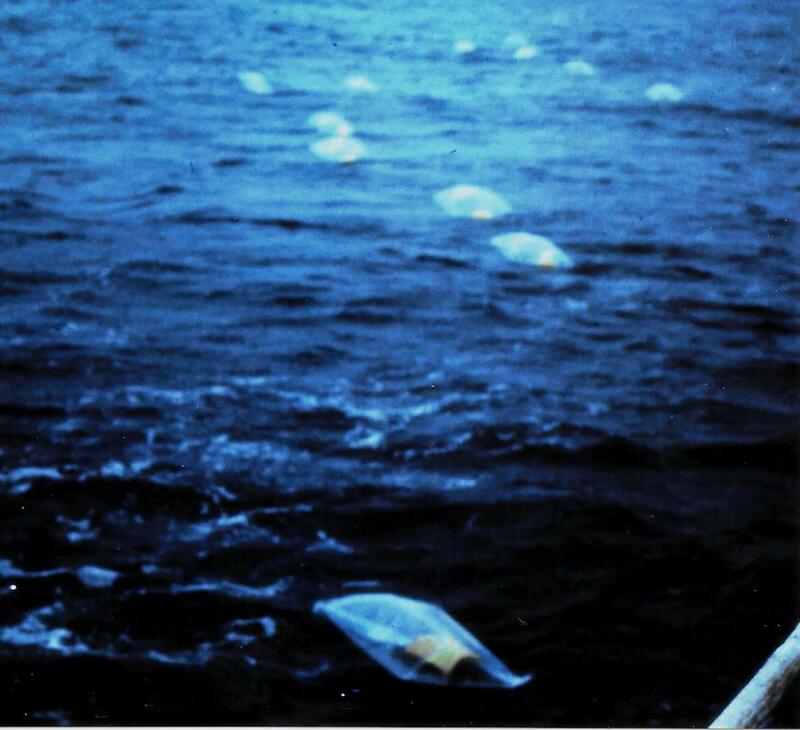 In one such instance, on the evening of August 10, 1970, a variety of float packages were inserted into the North Korea offshore waters by the Republic of Korea Navy. The contents of these floats were not identical, which marked the first time the technique was used. An example of waterborne dissemination is the float depicted above. This American container was used against North Korea. The float is a plastic jar with a bright red cap to draw attention. There are three items inside. 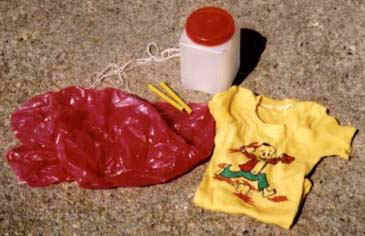 First, a colorful child's shirt with an amusing design, next a pencil strategically broken in half so that it can fit inside the plastic jar and finally, a bright red parachute (possibly to be used if the floats were dropped from aircraft). 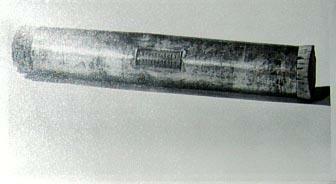 This same type of float was used against Vietnam, released from offshore submarines. Republic of Korea Navy technicians with U. S. PSYOP specialists prepare float bags to be drifted into North Korean waters and along the shoreline as part of Operation Jilli (Truth). A U. S. - Republic of Korea Cold War float containing a radio in its protective package. The sea currents flow from North to South. The radio has been placed in a pillow-size inflated plastic bag that acts as a sail. The package is moved against the current using south-southwesterly winds where it is picked up by fishermen at sea, or people along the shoreline. Magazines, leaflets, book marks, chopsticks, fishing line and other gift items were sent to North Korea through this method of dissemination. As the ship moves forward a trail of pillow floats follows. They will eventually be swept by the wind and tide to the North Korean coastline. The Americans would question North Korean defectors to determine what gifts were most desirable. Among them were cigarette holders (fishermens hands are usually wet); cigarette lighters (The matches tend to get wet); nylon cord; sunglasses; cigarette cases (To keep the cigarettes dry) and ball-point pens (they are very expensive in North Korea). Non-fisherman defectors preferred work clothes; winter underwear; socks; undershirts; gloves and cloth among 14 other items that were scarce in the north such as grain, sweets cash and laundry soap. North Korean soldier defectors wanted fountain pens and radios, but admitted that their officers said they contained explosives. The evil Americans and South Koreans waited for you to wind the watches or change the radio stations and then you were blown up. The Americans knew the kind of product they wanted to float north. Two examples are bars of soap that contained messages on the wrapper, or inside the soap that would appear as the soap was used. 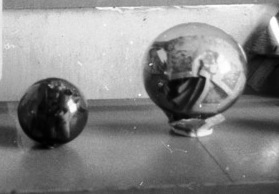 They wanted marbles because they were extremely cheap and the children were sure to play with them. The 7th PSYOP Group recommended that in selecting gift items for the float program, the widest variety possible should be obtained. No standard float package should be created; rather a variety of packages should be disseminated on each mission, and as far as possible each mission should include a new variety of float packages. The reasoning behind this recommendation is that if a standard package was created, it would be very easy for North Korean security forces to check the packages found by fishermen and tell if anything had been hidden away. By keeping the contents random, the security forces would never know what had originally been inside the float. One morning in May or June, we were fishing near Mu Island. I was taking a nap after having cast the fishing net, when I was awakened by noise made by other crewmen. I saw the men reading five or six South Korean booklets of different types. The men said that these publications had been packed in a vinyl bag found floating on the water. One of the crewmen had picked it out of the water with a basket-type scoop net. While the crewmen were reading the material, the chief engineer of the boat, who was also the officer in charge of Party activity on board, confiscated the material and took it to his room. The chief engineer said that this material was from South Korea. According to my company leader and the assistant company leader for political affairs, wristwatches, fountain pens, and radio sets sent from South Korea were found in the area north of the Imjin River. They said that these things were fixed with explosives. Dials of the radios are fixed to Republic of Korea broadcasts, and if turned to other stations they explode. Members of my company were told not to pick up such things when found in the company area. The leaflet listing the South Korean radio frequencies was a great help to me in listening to the South Korean radio stations. However, South Korean news program schedules should also have been supplied in the leaflet. In the 1960s, I went out on a small patrol boat with the South Korean navy and watched them float thousands of Styrofoam-packed transistor radios ashore in North Korea. A friend of mine was the U.S. Army civilian who edited the magazine distributed in South Korea through an arrangement with the Korean National Police---an outrageous waste of my tax dollars. I never saw any evidence that any psychological operation had any impact at all. 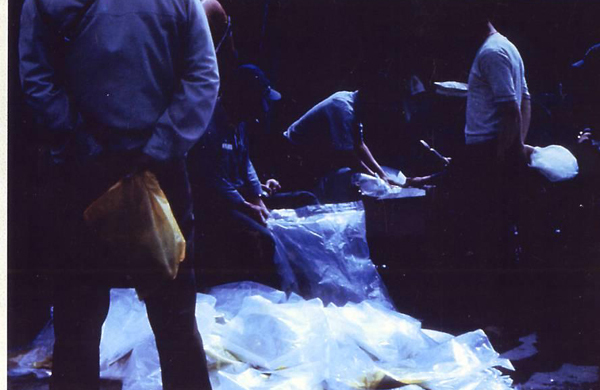 Other types of floats used against North Korea were simple plastic bags containing Korean-language publications and/or nylon string that could be used by the fishermen to make nets, hang clothes, and dozens of other uses. In order to get the North Koreans to pick up the floats and hopefully read the leaflets, gifts were often placed inside the floats. The interrogation of North Korean fishermen determined that the gifts they most wanted to find in the floats were; cigarette lighters, cigarette cases, cigarette holders, nylon cord, sunglasses, and ball-point pens. Non-fishermen preferred various articles of clothing and cash. Other recommended items to be placed in the floats were; soap bars, rulers, and marbles for the children. The U.S. aggressor army carried out another military provocation in the western sector of the front in the Han River area. 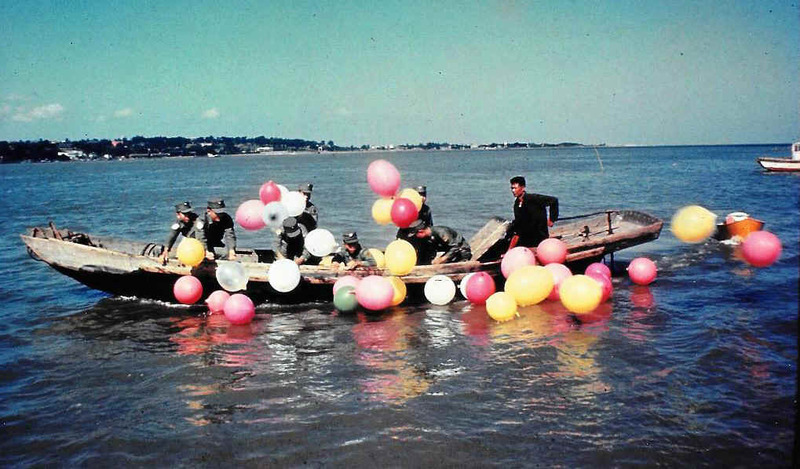 About the same time when these rubber boats and balloons arrived at the river bank, the U.S. aggressor army carried out a heinous provocation by firing hundreds of rounds of heavy arms fire at our peoples army outposts and the populated district, Our people's army sentinels took an immediate countermeasure and sank all the explosives floated by the US aggressor army, completely foiling the enemy's provocative attempts. Still, every year the activists send hundreds of thousands of leaflets across the border, and thousands of DVDs and thumb drives loaded with everything from Bibles to American sitcoms to South Korean historical dramas. Some are transported by hired smugglers via China. Some are sealed inside 2-liter water bottles tossed into the surf along the South Korean coast, then carried north by the current. There were also Cold War operations where American-made leaflets were placed in plastic resealable drinking containers and released off the coast of Red China by vessels from the Republic of Korea. Captain Nahlik of the 7th PSYOP Group told me that he had recommended Submarines as a way to send leaflets into mainland China during the Cold War. The leaflets would be put into the torpedo ports and discharged when in the area where current would be flowing towards the mainland. The method was workable and liked but rejected because it would enable the Chinese to determine where our submarines had been patrolling by doing backward current studies. These balloon floats were released from Taiwan when the winds were just right to drift north to the Chinese coastal area. It is thought that they probably carried both leaflets and gifts to the people of the mainland. Combat arrogance and complacency - Who is the target? One day after work we had our Chinese Driver take us to a mine-free section of beach where we could swim in safety. When we arrived there we saw thousands of bottles lying on the beach. Apparently the tide turned and brought the leaflet bottle back to shore instead of towards the Chinese mainland. I brought one back but have never opened it and removed the leaflets. The glass ball appears to be a normal fish-net float with a hole drilled in it through which propaganda is inserted. Then a wooden peg seals the hole. The sea floating operation is more aggressive. Speedboats manned by frogmen maneuver as close as is deemed prudent to the Chinese coast and jettison their cargoes of plastic leaflet containers. The main American proponent of psychological warfare leaflets during Operation Desert Storm was the 4th Psychological Operations Group (Airborne). They produced and printed over 29 million leaflets. The Coalition forces packed M129E1 leaflet bombs with up to 54,000 machine-rolled leaflets, which were dropped over Iraqi concentrations by F-16, F/A-18, B-52, and MC-130 aircraft. Other leaflets were delivered by balloon. Interrogation of Iraqi prisoners revealed that 98% had seen Coalition leaflets. They also did one leaflet float operation, before the actual shooting war started. We had about 15 people putting leaflets in the bottles, along with pebbles for ballast. Then we tried them out in a bathtub to make sure they would float right. It worked then, so I couldn't think of any reason it wouldn't work in the ocean. Richard Johnson adds in Seeds of Victory that about the same time, American F-16 aircraft dropped the leaflets in M129E1 fiberglass leaflet bombs on two sorties over Iraqi forces defending the coast. 88,000 leaflets were dropped on 15 January and 120,000 leaflets on 6 February. The plan was a complete success. The Iraqi forces stood firm on the beaches and watched the ocean right up until Coalition forces from the western desert attacked and destroyed them. This leaflet was originally printed in full color. It was later printed in black and white. 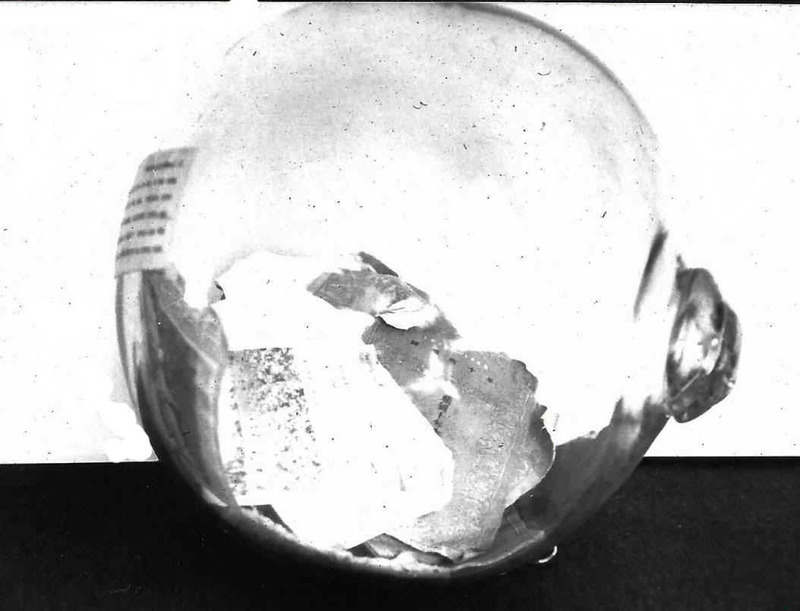 I actually got my black and white specimen from a leaflet bomb that was left open as part of an exhibit to show how the leaflets were packed in the bomb. I sampled the bomb! 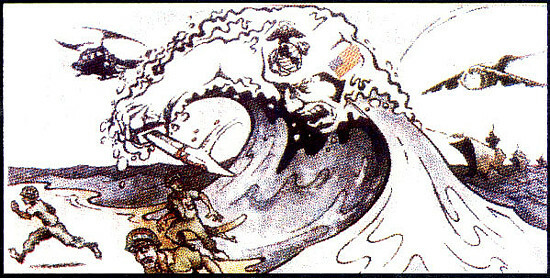 Original artist concept of the Marine Tidal Wave leaflet. Twenty U. S. amphibious warships with nearly 8000 Marines and 10,000 sailors were on-station in the Gulf of Oman. 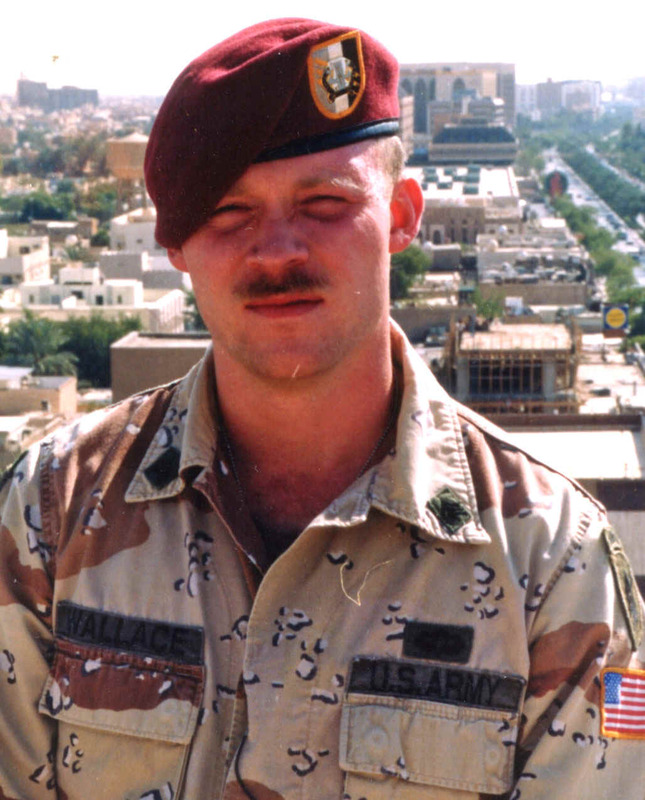 Before Desert Storm began, the task force enacted elaborate practice landings on Coalition beaches in the Persian Gulf. Five divisions of Iraqi infantry entrenched in Kuwait, some 80,000 men in all, watched and listened with keen interest as U. S. amphibious forces conducted these highly visible exercises, often accompanied by members of the international press corps. American battleships actually fired on the beaches so that the Iraqis were sure the attack was about to occur. It was a remarkable deception operation. Did the plan work? The ground war took exactly 100 hours. 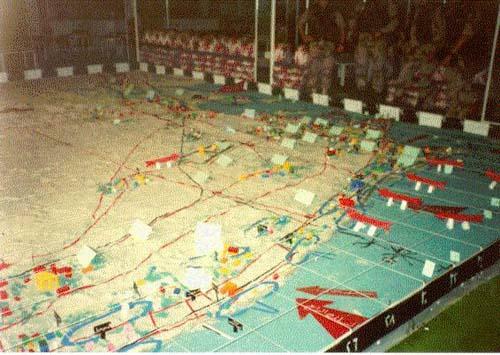 We will never know for sure what part the Marine invasion leaflet played in Saddam's defeat, but we do know that the Iraqi III Corps commander's 20 x 30-foot intelligence map of Kuwait found on a Kuwait City floor depicted virtually every Coalition avenue of approach from the sea. To the very end, Iraqi troops nervously watched the Persian Gulf for any sign of the dreaded U. S. Marines and their landing craft. They waited in vain. On 27 July 2016, North Korea sent plastic bags, each carrying about 20 leaflets, down the Han River. The river flows through Seoul, South Korea's capital city. 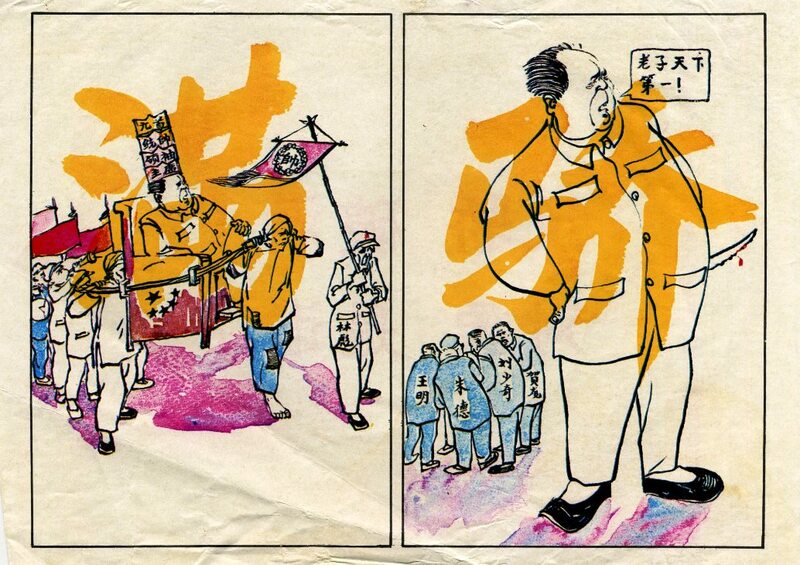 The leaflets contained threats to launch missile attacks, and the Norths revisionist history of the Korean War where they claim that they won a resounding victory. Some of the leaflets contained messages that claim July 27th, Armistice Agreement Day, as the anniversary of North Koreas victory over South Korea. 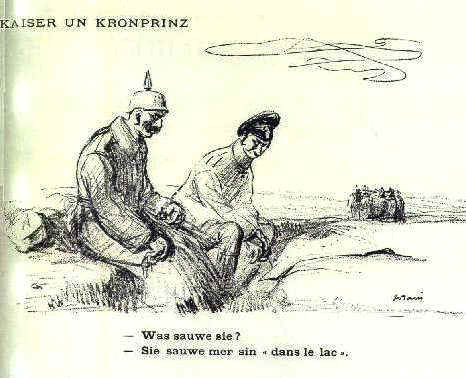 The North insists it won the war and that the armistice was only reached because the U.N. forces sued for peace. With a possible peace between North and South Korea on the horizon, the South Korean Government has cracked down on the sending of leaflets by balloon. However, there are still some patriotic and religious organizations using bottles and the ocean tides to deliver their message. 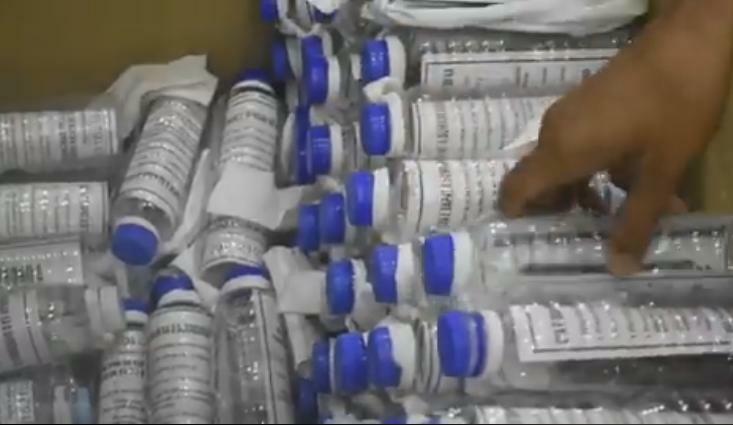 In May 2018, hundreds of half-gallon bottles were turned into gift packages, filled with a kilogram of uncooked white rice and a single US dollar bill; goods it would take the average North Korean 40 days to earn. Also inside is medicine to kill parasites, since doctors found worms in the stomach of a North Korean soldier who darted across the DMZ last year to defect. Finally, a USB stick full of videos with information from the outside world. In October 2017, The Joint Task Group Tabang's leaflet airdrop was made to support the efforts of the Civil-Military Operations Regiment loudspeaker teams and the assaulting troops in the call for the remaining terrorists to surrender and to give safety tips to the civilians who were held hostage by the terrorists. 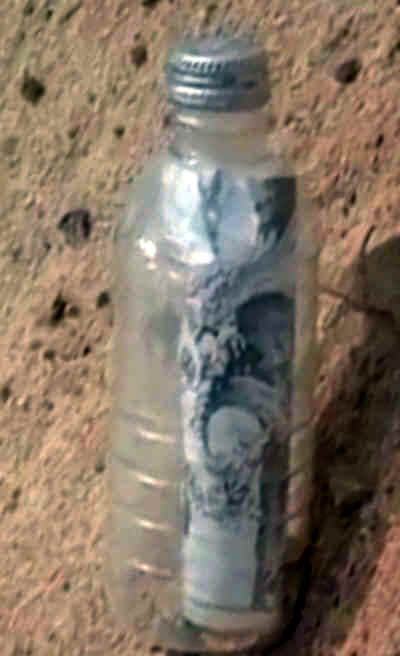 1000 water bottles were filled with surrender leaflets and dropped in the last stronghold of the terrorists. 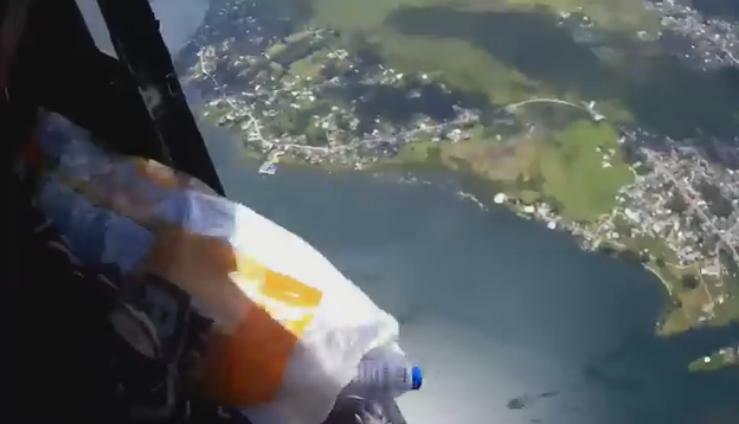 Just as the Coalition did in Operation Desert Storm, the Filipinos placed their leaflets in plastic water bottles and dropped them over the water where they would float to shore and be found by the enemy. This is just a short look at one method of disseminating propaganda leaflets. Leaflet floats are not all that popular because they only affect those living along the coast or those that work on the water. Leaflets from the float will seldom make it inland to more populated areas. They are also easy for the enemy to find and destroy. Readers who would like to discuss this method of distribution further are encouraged to write to the author at sgmbert@hotmail.com .